The Worst Witch – First the books, then the TV series... now it's on stage! The Worst Witch has been delighting children since the mid-1970s thanks to Jill Murphy's magical books. Several versions have appeared on TV over the years. Most recently it's been a smash hit on TV, a superb international production streamed on Netflix and shown on CBBC and ZDF. The third series kicked off in early January 2019, and now the stage show is set to thrill youngsters all over again. Brilliant! The show is packed to the rafters with all your kids' best-loved Jill Murphy characters, it's action-filled stuff, and the whole thing has been adapted for the stage by Emma Reeves. It's directed by Theresa Heskins, who won the 2017 UK Theatre Award for Best Show for Children and Young People, and is full of glorious original songs, music, magic and – of course – utter and total chaos of the very best, witchy kind. 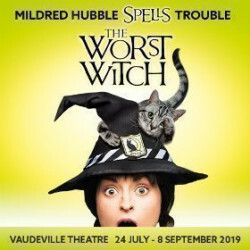 Produced by Royal and Derngate, The Worst Witch takes place at the magnificent Vaudeville theatre this summer, after a cracking world premiere in autumn 2018. The show is designed by Simon Daw, who enjoyed acclaim for his work on Humble Boy. The music comes from Luke Potter and the aerial consultancy from Vicki Amedume. The choreography comes from Beverley Norris-Edmunds, the stage illusions are crafted by John Bulleid, and the lighting design comes from Aideen Malone. The sound's by Leigh Davies, puppetry direction and design is by Paschale Straiton, and the casting carried out by Anjo Carroll. Mildred Hubble was a perfectly ordinary girl until she found herself in an extraordinary place - a school for witches. She's in her final year now, but she's just as accident prone as ever, and she and her fellow proto-witches are just about to start out on an adventure to end all adventures. At the same time the horrid Ethel Hallow is jealous, constantly finding ways to spoil the fun for Mildred. Strict Miss Hardbroom hates fun of every kind. And there's an old enemy in the mix, too, someone whose plans for revenge could destroy the academy, maybe even the world. Will the young witches win the battle for their future? Featuring Jill Murphy's much-loved characters, the production includes original songs, music, magic and a very large and amusing dose of Mildred's typical total and utter chaos. The brand new story revisits moments from the books, so there's a lovely familiarity about it. But at its core there's also a serious message. Right now, at long last, women are grabbing back power and rebalancing society. It's the ideal time for a play about young women who are learning, both together and individually, to use their power for everyone's good. Jill Murphy's The Worst Witch stories have sold more than five million copies. No wonder when they're so well-loved by millions of kids. Why not treat your little ones to some dazzlingly exciting, fun summer magic? This show is perfect for kids aged 7 and over, not recommended for children of three and under. 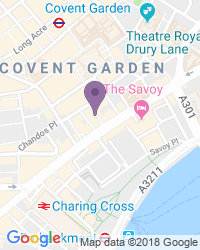 Use the search box at the top left of this page to search for The Worst Witch tickets availability.